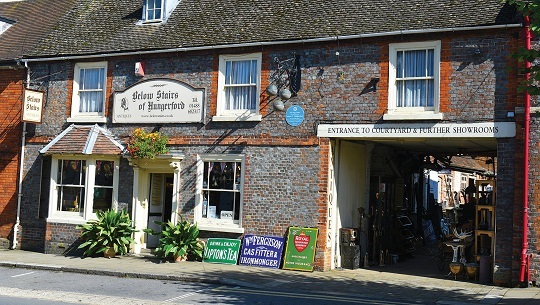 Below Stairs of Hungerford is a unique Antique shop specialising in items of the 19th and early 20th Century. Our high street shop, with five themed showrooms around the courtyard contain a magical view into the period. The range of items we stock can be seen by looking at the list of over 200 categories of stock listed. We have a very extensive stock in the shop and showrooms, with the Online store offering an huge range of current stock ready to order online. Provision of good descriptions is a feature of our service, so you can buy with confidence. In addition to our Online Store, pictures and prices may be sent by email, deliveries can be arranged worldwide. Our Online Store will usually determine all dispatch costs, but for unusual shapes, weights or more complex shipping destinations, we will need to calculate and quote individually. If you are a collector of a particular subject matter, or are looking for a specific item, we maintain a very successful customer requirements file and would be pleased to include your details if you let us know them. Our extensive stock is mainly refurbished by our own workshops and sold ready for use. We are also pleased to quote for restoration work on customers own items.